Known for her energy and enthusiasm, Janice Dale Pope is the original creative mind behind Anything But Boring. Dreaming up new designs is her passion. Janice seeks to make projects that not only look great, but help solve everyday problems of contemporary life. She enjoys meeting new people through her classroom instruction and has taught both domestically and internationally. Students in Janice’s classes always have a good time; you know laughter is contagious!. Sewing since a teenager, this almost 60 year old quilter has created and carried her own style of purses for several years. 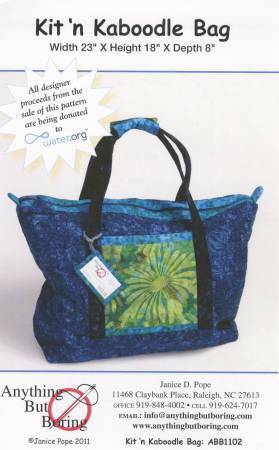 Now her bag and quilt patterns are available for everyone; especially those with a limited time to sew. Shouldn’t all patterns be quick and easy to make? She thinks most should! She hopes you will enjoy trying one for yourself or for a gift. Janice resides in Raleigh, NC with her husband of 35+ years and enjoys having one of their three sons and two of their four grandsons nearby. When not working on new designs or filling orders, she enjoys traveling, church activities, reading and is an avid Carolina Hurricanes Hockey fan. Quilter, designer and instructor, Mary Corcoran specializes in transforming classic patterns into modern designs. 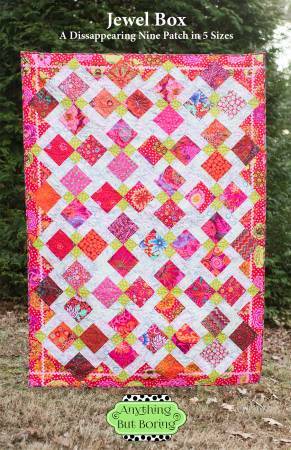 Mary’s expert and innovative use of color, pattern, and new fabrics combine to create beautiful and exciting quilt designs that are accessible to the novice quilter and new and challenging for the practiced quilter. Mary engages in all aspects of quilting: appliqué and piecing, machine and hand work, traditional and art piecing, all outlets for her unique expression of color and composition. She discovered the art of quilting in 2000 and hasn’t looked back. Constantly seeking new challenges in pattern and technique, she also enjoys the art and discipline found in simple quilts. Mary makes her home in Laramie, Wyoming, where she lives with her husband, and entices her grandson, two sons and their families to visit the wild west. She loves being ‘Nana’ to her grandson and enjoys cooking, reading, gardening and hiking. 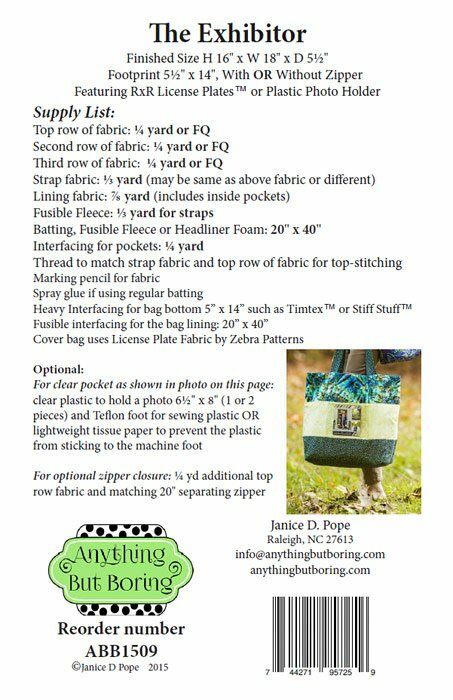 Kit 'n Kaboodle Bag From Anything But Boring By Pope, Janice Kit ‘n Kaboodle Bag New! This bag is large enough for overnight or weekend travel. It is a great size for carrying a quilt to bee and would make a great gift. New! The Tidy Traveler Every “Road Warrior” needs a car bib, seat belt cover and trash bag! 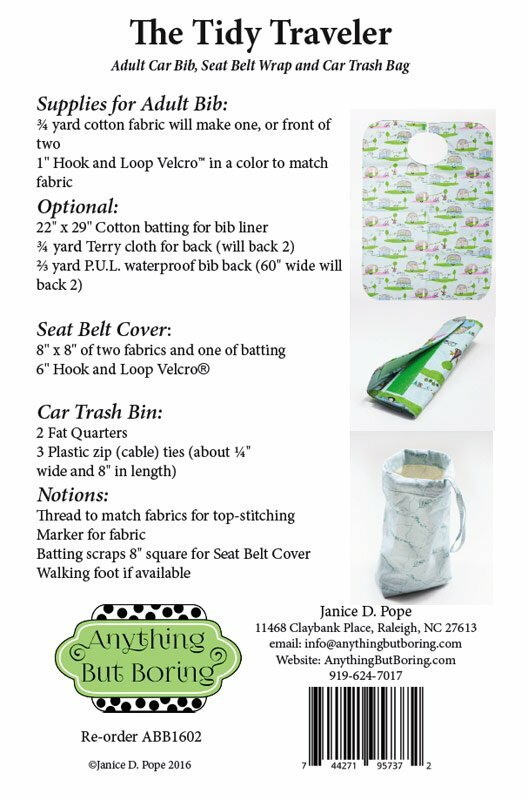 Even soccer moms and vacationers eat in the car and this pattern will help them stay neat and tidy!